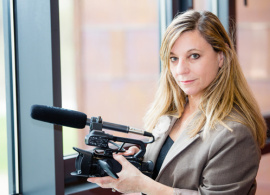 After spending four years living and teaching journalism at AUBG, award-winning documentary filmmaker Melody Gilbert has chosen Chicago as the city where she’ll launch her latest documentary project. She’s on a one-year leave of absence from AUBG. “The Summer Help” reveals the challenges of two Bulgarian students from AUBG during a summer in the United States. It was the subject of a fundraising event and sneak preview of selected clips on August 24, at the Music Box Theater, Chicago. 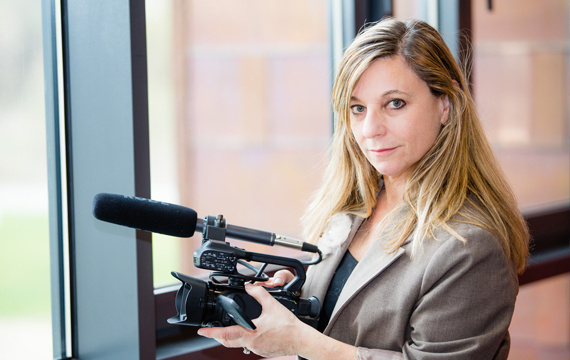 Gilbert, a prolific filmmaker who has directed six feature-length films, moved from Minnesota in 2011 to teach at AUBG and to seek out new stories to tell. It’s there that she learned of the J-1 visa program, commonly known as “Work and Travel,” that allows foreign college students to do summer work in the U.S. to help fund their college studies. The main characters of “The Summer Help” are two AUBG students who landed in Myrtle Beach, S.C. There they toiled as hotel maids and then took on extra work in a pizza shop and an amusement park. It was the girls’ first trip via airplane, and it was an eye-opener, Gilbert said. The film also features AUBG students who work in Martha’s Vineyard and in Provincetown, Massachusetts. Some of Gilbert’s students are on the production team for “The Summer Help.” Hristiana Kirova (2014) is the assistant editor, Dumitrita Pacicovschi (2015) is the associate producer, and Igor Myakotin (2015) is a production assistant. Myakotin also shot and edited some footage. Other students who contributed included Alexander Khambir (2015) and AUBG senior Sergey Zhelezko (trailer editors), and Dima Vitanova (AUBG senior), who did additional cinematography. Ana Devdariani (2016) worked on the graphic design. “The Summer Help,” four years in the making, is in its final stages of production. Gilbert recently launched a Kickstarter campaign to raise funds to finish the film. A video with Professor Gilbert talking about the film and showing a trailer is in the link to the Kickstarter campaign for the film.